If you are still hopping on the BSBP second reveal, here is the link . I'm showing my BSBP pieces one by one all over the week, here is the 4th one. This necklace has been an ever changing project until the very last minute. This beautiful clasp is not so simple to use, and those freshwater pearls were great to match it, but other than this I didn't know what to do with them. I was making a multistring bracelet, when I found 2 beautiful ceramic green flowers in my stash. 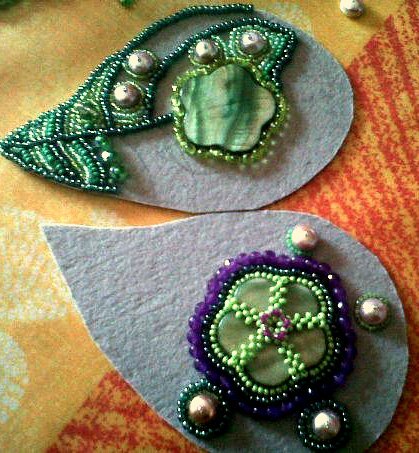 They have the same size and shape of the clasp, so I decided to make some sort of big leaves with these flowers in the centre. I wanted to put the toggle between them, so it would have been on the frontal part. I was confused, until I decided to make 2 small leaves and use the clasp as focal. Something simple. But then I cut the big leaf making it a big flower shape, and decided to use THAT as focal. I like this color combo with green and fuchsia/purple, which is by the way the color combo I offered my partner. I'm still looking at those leaves, can't realize I actually made them. I won my fear of bead embroidery pretty fast! How interesting to know the artistic road you traveled to get to the finished piece. The focal, well the entire necklace, is really gorgeous. Now that I know the focal started as a leaf it makes it more interesting. What did you do with the first leaf that you didn't like? Did you transform it into something else? The leaves you ended up using by the clasp look just wonderful. If that is your first bead embroidery I'm impressed, great job! I'm so glad I've been slow getting through the reveal, because I got here at the perfect time to see all four of your reveals -- all beautiful work, too! The Red Lady is a knockout, for sure! thanks Bobbie for stopping by and reading all of them! Thanks Natalie, you're very kind! Those leaves are fantastic, girl!...and that is a wonderful necklace! I would love it too with just the leaves, pearl flower clasp and the chain...beautiful! Thank you Lori! I still can believe I made it without making a big mess as usual! Oh, this is stunning - love all the seed bead work I've seen in this blog hop - it amazes the daylights out of me for sure!! Thank you so much Shel!